Johann Sebastian Bach (March 21, 1685 - July 28, 1750) was a German composer and organist active in the late Baroque era who has been recognized as one of greatest composers of the Western classical music tradition, often called the "master of masters." "The aim and final end of all music should be none other than the glory of God and the refreshment of the soul. If heed is not paid to this, it is not true music but a diabolical bawling and twanging." Bach came from an extremely musical family, which had been supported by local governments and churches throughout Germany for many years. After graduating from the St. Michael's School in Lüneburg, he became a court musician in Weimar, where his fame as a keyboardist began to spread. In this time, he also began a career as organ inspector, which he kept up in some form for the remainder of his life. Later in the year, Bach became the organist at St. Boniface's Church in Arnstadt with help from some family connections, where he often clashed with authorities over the quality of the choir and a long, unauthorized leave of absence where he visited the great composer Buxtehude, who became an important musical influence. After leaving the church and serving as the Kapellmeister and court organist in various cities, Bach ended up in Leipzig in 1723, where he spent the rest of his life. As Cantor of the Thomasschule in Leipzig, Bach took on a greater variety of responsibilities, including teaching Latin and supervising the dormitories, and was never entirely respected by the authorities. Indeed, when he was hired, the council remarked "because the best men for the job could not be procured, we have been forced to accept a mediocre one instead." Bach also simultaneously took the job of Director of Music in all of Leipzig's churches. In this capacity, he produced a stunning output of cantatas: between 1723 and 1729, he had produced close to three whole yearly cycles, or 300 cantatas. After 1729, Bach also wrote much of his chamber music, orchestral music, and keyboard works. He published many of the latter in his lifetime at his own expense, though most of his compositional output remained unpublished after his death. Although Bach was always famous as an organist and his music remained well-loved in Leipzig, his music was mostly forgotten in Europe until several of his works were revived by the composer Felix Mendelssohn, most importantly an 1829 performance of the St. Matthew Passion. 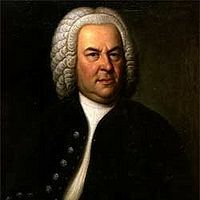 Bach had several children who became famous composers in their own right, such as Wilhelm Friedemann Bach, Carl Philipp Emanuel Bach, and Johann Christian Bach. Bach was a devout Lutheran, and much of his music was religious in nature. Bach attributed the beauty of his music to God, by writing the letters "S.D.G." or "Soli Deo Gloria" in many of his scores and has been quoted as saying, "The purpose of all music is to give glory to God and bring rest to the soul". He is well known for his complete mastery of counterpoint, as well as his use of styles from many different regions of Europe. His music is filled with melodic harmonies and overlaping melodies, giving the impression that every instrument has the melody. He also used the cruciform B-A-C-H motif in his work as a sign of devotion to Christ, although future composers used it to pay homage to their great predecessor. Bach also had a great influence on composers who followed him. Composers such as Mozart, Beethoven, Schumann, and Mendelssohn began using more contrapuntal elements in their works as a result of his influence. In addition, Chopin's Preludes Op. 28 and Shostakovich's Preludes and Fugues Op. 87 are based explicitly on the Well-Tempered Clavier. Other works that play explicit homage to Bach include Beethoven's Diabelli Variations and Franz Liszt's Prelude and Fugue on B-A-C-H. There have also been many "modernizations" of Bach's music by artists as varied as Wendy Carlos and Jethro Tull. Bach was an avid coffee-drinker, so much so that he wrote an ode to the drink in one of his secular cantatas (BMV 211), which was performed at Zimmerman's coffeehouse between 1732 and 1734. Since Bach's music was virtually unknown outside of a small circle of Leipzig-based connoiseurs after his death, it was something of a miracle that composers Mozart and Beethoven learned of it. Beethoven's teacher as a boy, Christian-Gottlob Neefe (who came from Leipzig), made sure that Beethoven played Bach's Well-Tempered Clavier; the young genius had memorized all 48 by the age of 12! Mozart learned of Bach's music relatively late in life, in the 1780s, from Baron Gottfried van Swieten, an ambassador and connoisseur who brought Bach's music with him to Vienna (after he also had learned of it in Berlin). Swieten would hold all-night music sessions where only Bach and Handel was played; a few decades later, Beethoven would also be invited to Swieten's palace. ↑ New Grove Dictionary of Music and Musicians, "J.S. Bach." This page was last modified on 26 September 2018, at 12:49.